There is plenty of rain forecast at Newbury this afternoon and in the opener, I expect to see Johnny Barnes (1.50) go close for John Gosden and Adam Kirby who did us a favour courtesy of Harry Angel in the July Cup last weekend. The selection is 8/1 with BetVictor and that looks a fair each way price for a horse who finished runner up in a Group 1 over a mile on soft ground as a juvenile. The 3/1 favourite Realize has run well on soft ground in the past and the booking of Ryan Moore suggest connections feel he has an excellent chance of landing his hat-trick – note he is still 10lbs lower in the handicap on turf than his all-weather rating. The lightly-raced Best Of Days (2.25) drops back in trip having finished last on his seasonal reappearance at Royal Ascot over a-mile-and-a-half. The selection has only had the four career starts but he has won half of those races and is entitled to come on for his Ascot run – at 9/2 with BetVictor he is another each way recommendation. At Newmarket in the listed Aphrodite Stakes High Hopes (2.40) has won three of her last four starts for David Simcock and she is taken to take the step up in class in her stride with Jamie Spencer in the saddle. The filly will appreciate any further rain and at 7/1 she, too, is an each way price. We suggested earlier in the week that Curious Carlos (2.10) might be the one for the listed Summer Hurdle at Market Rasen and at 7/1 with BetVictor he gets the each way vote. I suggested on that occasion that there was little guaranteed pace in the race and the hope is that young conditional James Bowen is tactically aware with Rossetti likely to get an uncontested lead out in front. Excellent Result would be interesting in the 2m 4f handicap hurdle if there were little or no further rain but Tangolen (3.55) must go close from the foot of the weights for Fergal O’Brien despite the fact that the selection is a better animal over fences than hurdles. The nine-year-old won a handicap chase at Perth from a mark of 126 earlier in the month, and is a stone lighter this afternoon. The same O’Brien/Brennan combination team up with Lovely Job (4.30) who is taken to follow up his impressive Uttoxeter win when returning from a 12-month absence. That win was gained over three miles but, if he is in the same mood, he will be difficult to beat. At Haydock this evening, Wordiness (8.00) can follow up his win over Doncaster over two miles earlier in the month from a 6lbs lower mark. The selection is now a nine-y-old but has won over higher marks in the past and has every chance as long as the ground is good or better. In the opener, Kachess (5.55) drops back to the minimum trip and she showed early pace when leading from a poor draw, albeit over 7f, at Wolverhampton last time. The selection has not won since scoring at Goodwood on debut but that was over five furlongs and the handicapper looks to be giving her a chance. 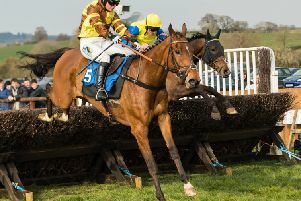 Patricktomboru (4.20) lost nothing in defeat when runner up at Newton Abbot last time and can go one better back over C&D as long as there is no significant rain tomorrow. The selection has been raised 3lbs for that effort but that is fair enough and I was impressed with young conditional Mitchell Bastyan who looks good value for his 7lbs claim. There is a £20,000 handicap chase at Stratford tomorrow and the ground will be pivotal with Definite Future wanting good or faster ground. If, as expected, there is significant rain in the midlands over the weekend then Red Riverman (3.10) is taken to follow up his recent Uttoxeter success with his 6lbs higher mark halved by the 3lbs claim of Jamie Bargary. For all the latest odds head to BetVictor.com and follow @BetVictorRacing on Twitter.